The first of these two types of armoured vehicles that came to be known as a Kangaroo, was the ‘Priest’ Kangaroo armoured personnel carrier1, which made its battlefield debut in Normandy, during Operation TOTALIZE (7-10 August 1944), in which, the infantry was able to obtain their objectives without suffering heavy losses from the enemy’s defensive machine gun and mortar/shell fire, while traversing the ground from start line too objective. Also, the mobility provided to the infantry by the ‘Priest’ Kangaroo armoured personnel carriers, along with the armoured protection, resulted in fewer casualties and greatly increased morale. 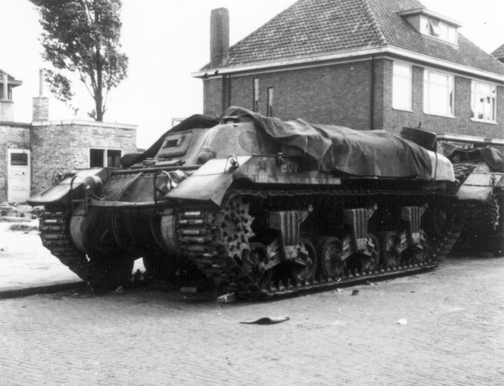 Their continued successful employment in Operation TRACTABLE (14-16 August 1944), convinced First Canadian Army that there was a continued requirement for armoured personnel carriers, for the transportation of infantry on the battlefield, in vehicles which had the same armoured protection and mobility as tanks. Due to the fact, that the ‘Priest’ Kangaroo armoured personnel carriers had been based on a ‘temporary measure’, and that, the vehicle it was based on, was on ‘loan’ from the Americans, steps were immediately taken to replace this ‘Priest’ Kangaroo armoured personnel carrier, with another type of ‘Kangaroo’ armoured personnel carrier, which was based on the Canadian designed and built, Tank, Cruiser, Ram, Mark II2. 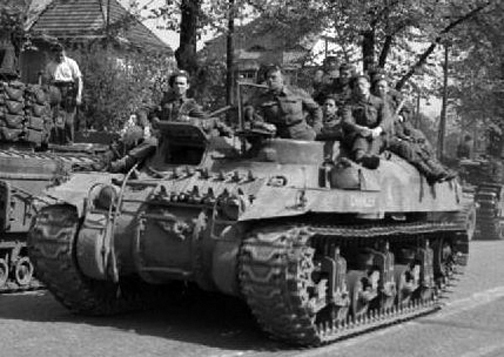 Following discussions between Canadian Military Headquarters (London)3, and First Canadian Army Headquarters, the decision was taken on 9 August 1944, to convert 100 surplus Ram tanks held in the United Kingdom, to that of armoured personnel carriers, for use by First Canadian Army in the field. 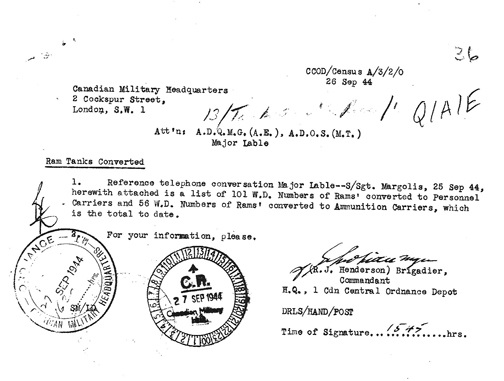 On 10 August, Canadian Military Headquarters, instructed No. 1 Canadian Base Workshop, Royal Canadian Electrical and Mechanical Engineers, located at Bordon Camp, Hampshire, to immediately convert 100 Ram, Mark II tanks, which were held on stock of No. 1 Canadian Central Ordnance Depot, Royal Canadian Ordnance Corps (Bordon Camp, Hampshire), to that of armoured personnel carriers on a ‘most urgent basis.’ These 100 ‘Ram’ armoured personnel carriers, were to be in France, ready for use by First Canadian Army, by 24 August 1944. The conversion of these Ram, Mark II tanks, to that of ‘Ram’ armoured personnel carriers, consisted of the removal of the complete turret, turret ring, and the internal ammunition bins (to accommodate ten fully equipped infantrymen). As well, any unnecessary hull fittings were to be removed. The No. 19 Wireless Set (radio)4 was to be reinstalled in the left-hull pannier5, on the left of the bow machine gunner’s position. Also, if time permitted, the vehicle batteries were to be moved from the hull floor, up into the rear of the left-hull pannier. Most of the Ram gun tanks, to be converted to ‘Ram’ Kangaroo armoured personnel carriers, were of the latest variant of the Ram tank, Mark II, and did not feature the cupola-equipped auxiliary turret mounted on the left-front of the hull, however, a small amount of Ram, Mark II tanks, bearing census numbers6 between CT159415 and CT159486, which were converted to ‘Ram’ Kangaroo armoured personnel carriers, retained their auxiliary turret. The Ram, Mark II tanks, that were converted into ‘Ram’ Kangaroo armoured personnel carriers, were from the CT15000 series, in the CT159402 to CT160145 block of census numbers. The removal of the complete turret, with turret ring, and internal ammunition bins, made the Ram an ideal armoured personnel carrier, which offered a lower silhouette, lighter weight, and reduced track pressure, which made it more manoeuvrable over soft ground. The ‘Ram’ Kangaroo armoured personnel carrier, was 19-feet (6-metres) in length, 9-feet, 1-inch (3-metres) wide, and stood at a height of 6½-feet (2-metres), with a ground clearance of 17-inches (432-millimetres). The hull was made from cast armour, and was two to three inches (51 to 76-millimetres) thick at the front, 1¼ to 2½-inches (32 to 64-millimetres) thick on the sides, and 1½-inches (38-millimetres) thick at the rear. The hull top armour was one to 1½-inches (25 to 38-millimetres) thick. The removal of the complete turret and internal ammunition bins, during conversion, reduced the overall weight of the vehicle from 65,000 lbs (29-tons), to that of approximately 53,760 lbs (24-tons). Access to the vehicle was gained through the large circular hole left in the hull top, by the removal of the complete turret, and turret ring. On those ‘Ram’ Kangaroos with the ball-mounted .30-calibre Browning machine gun, in the left-front bulge of the hull, there was a hatch provided for the co-driver in the top of the bulge, or if fitted, in the top of the auxiliary turret. The ‘Ram’ Kangaroo, was powered by a 450-horse power Continental R975/C1 radial air-cooled 9-cylinder engine, with a maximum speed of 25 miles-per-hour (40-kilometres-per-hour), a range of 144 miles (232-kilometres), and a fuel capacity of 150-gallons (682-litres). Access to the engine was provided through two engine compartment top plates, and through a set of rear engine doors, located below the rear plate of the upper hull. The main armament of the ‘Ram’ Kangaroo, was the ball-mounted .30-calibre Browning machine gun, which was mounted in the left-front bulge of the hull (or was mounted in the cupola-equipped auxiliary turret, if present), and was operated by the co-driver. The driver’s position was located in the right-front of the hull, and was provided with a large vision aperture, with a small vision port protected by very heavy glass, for use, when the large vision aperture was closed, although most drivers preferred to keep the large vision aperture open in all but the heaviest enemy fire. They felt it was not really safe to drive using the small vision port only, their field of view was too restricted and their vehicle was often used in rather tight quarters. The opening and closing of this aperture was carried out by the driver, from within the vehicle. The driver was also provided with a Vicker’s No. III, Mark I Periscope, which was mounted in the hull top, slightly to his left. On those ‘Ram’ Kangaroos with the ball-mounted .30-calibre Browning machine gun, in the left-front bulge of the hull, there was a Vicker’s No. III, Mark I Periscope mounted on the forward edge of the co-driver’s hatch, while on those ‘Ram’ Kangaroos with the auxiliary turret, a vision port protected by very heavy glass, was provided on the left of the .30-calibre Browning machine gun. The suspension used on the ‘Ram’ Kangaroo, was the ‘Vertical Volute Spring’ type, which consisted of 12 wheels in six bogies, with three bogie assemblies per track. The two wheels in each bogie assembly were pivoted on arms against a vertical spring, which was protected by the bogie-carrying bracket. A return roller was mounted either on top of, or on a trailing arm behind the bracket, the entire bogie assembly forming a self-contained fitting unit. External stowage bins (for various tools, and equipment), were also provided, along with the standard compliment of pioneer tools (shovel, crowbar, pickaxe, axe) and recovery/breakdown equipment (tow cable, jack and wood blocks), which were carried on all tanks. Four towing shackles were provided on the vehicle, two at the front, and two at the rear. Various external brackets were also provided for the carrying of spare bogie wheels, tarpaulins, and other miscellaneous items. Internal stowage bins for six boxes of .30-calibre ammunition7, was provided for, in the co-driver’s position, in the left-front hull. The conversion of Ram tanks, to that of ‘Ram’ armoured personnel carriers, began on 15 August 1944, at a rate of 15 conversions per day. By 22 August, the initial order for 100 ‘Ram’ armoured personnel carriers was completed. On 16 August, First Canadian Army, requested an additional 25 ‘Ram’ armoured personnel carriers be produced, as a reserve to the initial order for 100, so as to have a ready replacement for battle-damaged ‘Ram’ armoured personnel carriers. This was followed on 16 September, with another request from First Canadian Army, for the production of an additional 25 ‘Ram’ armoured personnel carriers, as a reserve. On 26 September 1944, Headquarters, No. 1 Canadian Central Ordnance Depot, Royal Canadian Ordnance Corps, informed Canadian Military Headquarters (London), that to date, 101 Ram tanks had been converted to that of ‘Ram’ armoured personnel carriers. As they arrived in Normandy, these ‘Ram’ Kangaroo armoured personnel carriers, were taken on charge of “F” Squadron, 25th Canadian Armoured Delivery Regiment (The Elgin Regiment), Canadian Armoured Corps8, starting on 18 September 19449, where they were held until arrangements could be made for their issue to the 1st Canadian Armoured Personnel Carrier Squadron, Canadian Armoured Corps10, in exchange for their ‘Priest’ Kangaroo armoured personnel carriers, with which they were equipped. On 21 September, in a letter to First Canadian Army Headquarters, it was noted by Lieutenant-Colonel G.C. Stewart, Commanding Officer, 25th Canadian Armoured Delivery Regiment (The Elgin Regiment), that the 25 ‘Ram’ Kangaroos, that “F” Squadron had received to date, were all found to be in reasonable condition, but that all would require through checking and minor adjustments to engines, track and suspension. He also noted, that they all still retained their No. 19 Wireless Sets. With having received reinforcements, each carrier now had a crew of two, instead of the one-man crews of the ‘Priest’ Kangaroo armoured personnel carrier. These ‘Ram’ Kangaroos all retained their bow ball-mounted .30-calibre Browning machine gun13. Most of the carriers were equipped with the No. 19 Wireless Set, and all still retained their intercom system, so the crew could communicate with each other and their infantry passengers. 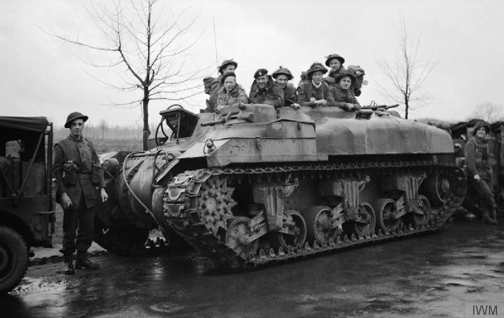 1st Canadian Armoured Personnel Carrier Squadron, now equipped with ‘Ram’ Kangaroo armoured personnel carriers, was from 12 October, tasked to support the British 51st (Highland) and 53rd (Welsh) Infantry Divisions in the forthcoming operations to clear the Scheldt Estuary and the opening of the Port of Antwerp (Belgium), with Troops No. 1 and No. 4 (with 31 ‘Ram’ Kangaroos) assigned to the 53rd (Welsh) Infantry Division and Troops No. 2 and No. 3 (with 31 ‘Ram’ Kangaroos) assigned to the 51st (Highland) Infantry Division. These operations the squadron was involved with until 22 October, when the complete squadron was tasked to the 51st (Highland) Infantry Division for the capture of Tilburg (Holland), which was to take place the next day (23 October). Having secured Tilburg, the squadron was next tasked, to the British 15th (Scottish) Infantry Division for operations. Reporting to Headquarters 15th (Scottish) Infantry Division, on the evening of 23 October, and being assigned to ‘lift’ the 10th Battalion, Highland Light Infantry (City of Glasgow Regiment) (with 28 ‘Ram’ Kangaroos) and the 2nd Battalion, Argyll and Sutherland Highlanders (Princess Louise’s) (with 28 ‘Ram’ Kangaroos)14, the squadron went into harbour at Zon (Holland), to await the next day’s (24 October) operation. As noted earlier, Lieutenant-Colonel Stewart, Commanding Officer, 25th Canadian Armoured Delivery Regiment (The Elgin Regiment), on 21 September had sent a letter to First Canadian Army Headquarters, regarding the condition of those ‘Ram’ Kangaroos received to date in Normandy, from the United Kingdom. Also in this letter, Lieutenant-Colonel Stewart addressed Captain Corbeau’s (Officer Commanding, 1st Canadian Armoured Personnel Carrier Squadron) concerns regarding the proper maintenance of the squadron’s ‘Priest’ Kangaroos (with which they were then equipped), with the limited resources and personnel that he had, with Lieutenant-Colonel Stewart suggesting amendments to the squadron’s War Establishment15, in both personnel and vehicles, requesting, that in light of operational value of the squadron, that action be taken to implement such amendments. Upon receipt of Lieutenant-Colonel Stewart’s letter, a conference was arranged, to take place at First Canadian Army Headquarters, on 29 September 1944, at which the future organization of a suitable unit to operate approximately 125 ‘Ram’ Kangaroo armoured personnel carriers, based on the operational experience gained by the employment of ‘Priest’ Kangaroo armoured personnel carriers, to date, by 1st Canadian Armoured Personnel Carrier Squadron, would be discussed. Both, Lieutenant-Colonel Stewart and Captain Corbeau, attended this conference, along with representatives of I British Corps Headquarters, and of various branches of First Canadian Army Headquarters. From this conference, it was agreed that First Canadian Army would recommend to 21st Army Group16 Headquarters, that a Canadian armoured personnel carrier regiment of three squadrons, capable of simultaneously lifting one-and-a-half infantry battalions be formed. It was also agreed, that Lieutenant-Colonel Stewart, in conjunction with Brigadier G.M. Grant, the Deputy Director of Mechanical Engineering, First Canadian Army17, would submit a recommendation of the personnel required within this armoured personnel carrier regiment, for the supervision of normal vehicle maintenance, and for the allotment of armoured recovery vehicles18 on the basis of one per squadron, and for the organization of a suitable light aid detachment19 to carry out all necessary repairs and adjustments within the regiment. It was also agreed, that a recommendation of the personnel required within this armoured personnel carrier regiment, for the maintenance of the communications equipment, would also be submitted, along with the recommendation, that the No. 19 Wireless Set, be retained in the carriers of a squadron headquarters, and in those of the individual Troop Leaders, while the rest of the carriers, be equipped with an intercommunication system, so the crew could communicate with each other and their infantry passengers. Lastly, it was agreed, that a crew of two each, would be recommended for each armoured personnel carrier within the regiment. To be continued in The ‘Ram’ Kangaroo armoured personnel carrier, Part 2. The author wishes to thank Miss Courtney Carrier, for proofing reading and offering constructive criticism, and comments, on my draft copy of this article, and Clive M. Law, for providing photos from the MilArt photo archives, and for publishing this article. 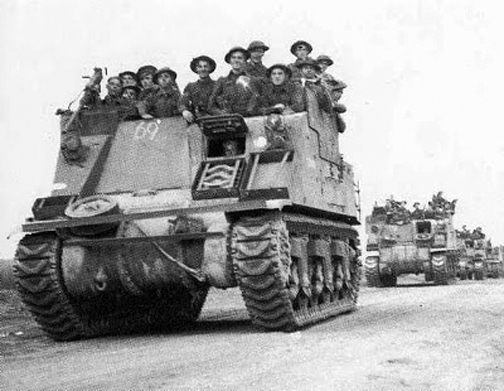 Which was based on the conversion of the M7 ‘Priest’ 105-millimetre self-propelled gun, to that of the ‘Priest’ Kangaroo armoured personnel carrier, see the MilArt article, ‘The ‘Priest’ Kangaroo Armoured Personnel Carrier, in Canadian Service, 7 August to 30 September 1944,’ published on 28 August 2014, for details. The Canadian designed and built, Cruiser Tank, Ram, Mark II, was armed with a 6-pounder (57-millimetre) Ordnance Quick Firing gun, and three .30-calibre Browning machine guns, one of which was mounted coaxially in the turret with the 6-pounder, while another, was mounted in an auxiliary turret, located on the left front of the tank, or in later production vehicles, without an auxiliary turret, in a ball mount in the left front hull. The third .30-calibre Browning machine gun, was mounted beside the commander’s hatch, on the turret roof, and used for anti-aircraft/ground defence. In order to provide a positive means of identifying individual vehicles, every Canadian Army vehicle was given a separate serial number, commonly referred to as census number. 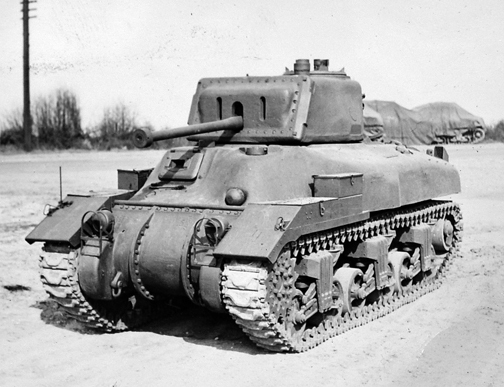 In the case of the Ram tank, this number was preceded by the prefix letters “CT,” the letter “C” denoting the vehicle as Canadian, and the letter “T” denoting that the vehicle was a tank. These census numbers were and were normally stencilled onto the vehicle in white letters 3½-inches (9-centimetres) high. Each box containing one 250 round belt of .30-calibre ammunition for the .30-calibre Browning machine gun mounted in the hull front. From the initial issue to the squadron of nine of ‘Ram’ Kangaroo armoured personnel carriers on 18 September, issues continued on a daily basis, so that by the morning of 30 September, “F” Squadron held approximately 81 ‘Ram’ Kangaroo armoured personnel carriers, for issue to the 1st Canadian Armoured Personnel Carrier Squadron, Canadian Armoured Corps. 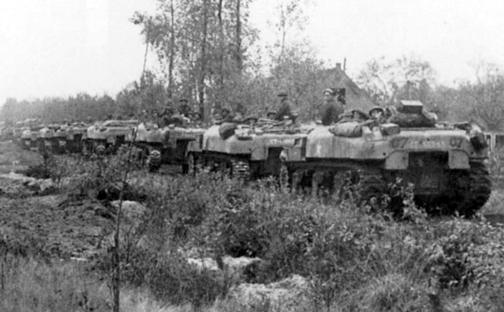 1st Canadian Armoured Personnel Carrier Squadron, Canadian Armoured Corps, had been authorized to form on a temporary increment basis, on 28 August 1944, to operate 100 ‘Priest’ Kangaroo armoured personnel carriers. One of the responsibilities of the Royal Canadian Ordnance Corps, was the storage and distribution of vehicles to the field army. 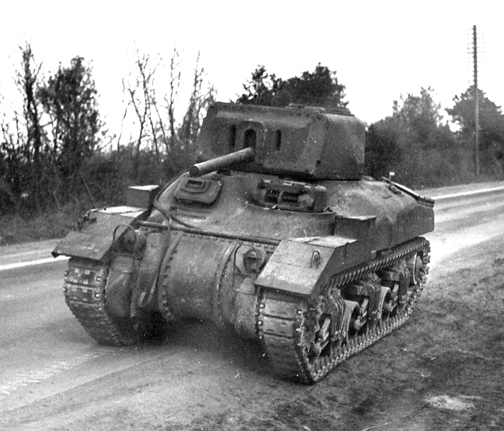 In addition, CT159871, which was issued to the squadron on 3 October 1944, was in the configuration of a ‘Ram’ armoured ammunition carrier, having been converted too such from a Ram Mark II tank by No. 1 Canadian Base Workshop, Canadian Electrical and Mechanical Engineers, which was later converted into a ‘Ram’ Kangaroo armoured personnel carrier. Although one, CT40926, had an auxiliary turret, having been converted from an earlier sub-model of the Cruiser Tank, Ram, Mark II. Both battalions were components of the 227th (Highland) Infantry Brigade, 15th (Scottish) Infantry Division. A War Establishment is a detailed listing of the authorized complement of men, equipment, and vehicles of a military unit. First Canadian Army and Second British Army, were under command of 21st Army Group headquarters. 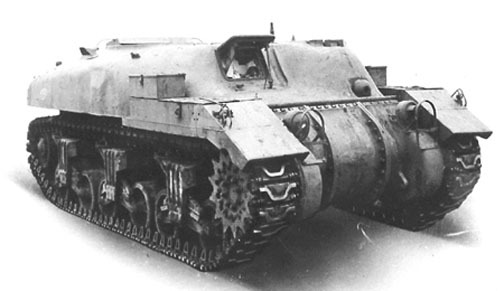 The armoured recovery vehicle was a tank developed to recover a bogged-down, broken-down, battle-damaged, or a mine-damaged tank from the battlefield to a location where unit mechanics could attempt quick repairs. Very interesting history of the “KANGAROO “I acquired a cap badge in January, not knowing anything about the existence of such a unit.